Viewings and collections are by appointment only, why not call us TODAY. Hybrids are a combination of pure breed chickens, bred together for a specific purpose - whether that be for disease resistance, egg laying qualities, egg colour or all round good looks! They are ideal for a few hens in the garden and/or for free range conditions, certain breeds are also well known for their excellent egg laying qualities. They tend to be disease resistant, and most are very friendly and make super once they have settled into their new home. All hybrid pullets are available from 16 weeks old and are fully vaccinated. Lovely docile brown bird, excellent layer - bred for maximum egg production and a calm temperament. Ideally suited for free range conditions, and for small gardens. Lays approximately 325 medium/large brown. A very ‘people/child’ friendly docile bird, ideal for the first time chicken keeper, and seasoned chicken keeper alike. Excellent egg layer. Colouration varies from a deep burgundy red to a light ginger with cream coloured markings. Great for the Eglu. Beautiful docile dark burgundy brown bird with a black tail - ideally suited for free range conditions, and small gardens, will adapt well to any management system. Excellent layer. Lays approximately 317 - 337 mid-brown eggs, laying period 19-76 weeks. Not easily stressed. Average weight of egg is 62.5 grams. Good for first time chicken keepers. A lovely bird with beautiful rich shiny black plumage with varying amounts of copper/gold coloured feathers on the chest and neck. The black plumage has a lovely green/purple sheen to it in the sunshine. They are good layers, and lay approximately 300 mid brown eggs in their first year. The Bovan Nera is a Rhode Island Red crossed with a Barred Plymouth Rock, and is a tough free range bird and that is very disease resistant. Another real good looker, and great egg producer! Plus an ideal bird for the ‘Eglu’, due to its size. Next available 3rd May 2019 – reserve yours today to avoid disappointment (April batch all sold). A beautiful striking placid grey/blue bird, with a darker grey head and neck. Bred from the Rhode Island Red crossed with a Cuckoo Maran. In her first year she will lay approximately 240 brown eggs that have a ‘plum blush’. Each individual feather has a sheen around the edge – just like the Rhode Island Red. Available NOW! – last few. 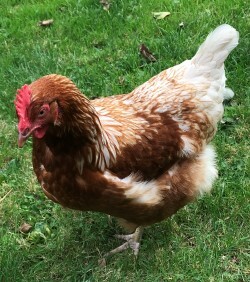 A lovely breed that comes from a Rhode Island Red crossed with a Maran. The Cuckoo colouring ranges is generally a slate grey cuckoo colouration with a silver grey cuckoo neck - very similar in looks to the pure breed Cuckoo Maran. She has a deep breast and upright tail that lays approximately 260 warm light-chestnut brown eggs. The Sussex is a hybrid version of the Light Sussex pure breed. This striking bird lays approximately 280 medium light brown eggs per year. She has a lovely creamy/white plumage with black columbian markings. The Sussex Reverse (the one at the front of the picture) is a pure rich black coloured bird with a small amount of white/silver coloured markings on her neck and chest, and the black feathers have a lovely green/purple sheen to them. She lays approximately 280 light medium/large brown eggs per year. A stunning looking bird. Next available 3rd May 2019 – reserve yours today to avoid disappointment. A strikingly brilliant white bird with an upright carriage and tail, and a large beautiful red floppy comb. She lays approximately 315 beautiful white eggs and is a good second year bird. Flighty at first, but a stunning bird and a very good consistent white egg layer. The bird opposite is a young 16 week old bird. The Skyline has an 80% likelihood of laying a bluey/green egg. She is a lovely bird, some have a ‘quiff’ on the top of her head. Each bird varies in colour but they are either a creamy/beige bird tinted with blue/grey feathers, or a deeper ginger/grey/red/brown bird with flecks and deep blue/grey edging to their feathers. She has a nice temperament and a slight body, is nervous when young, but tames down to a lovely gentle bird. The Maran Cuirvree has a beautiful rich shiny black plumage, with varying amounts of copper colouring on the neck and body. The black plumage has a lovely green sheen to it in the sunshine. They lay approximately 210 light chestnut coloured eggs a year. The Maran Cuirvree are very hardy, and suitable for free range or other managed systems. This tame easy going bird is a lovely white bird with a hint of amber in her plumage. She lays approximately 280 medium brown eggs per year. A very ‘people/child’ friendly docile bird, ideal for the first time chicken keeper, and seasoned chicken keeper alike. Don’t forget we sell all the other items you will need, including housing, feeders, drinkers, feed, etc, A ONE STOP SHOP! Just make an appointment to come and visit us, and choose which birds you’d like to take home. You can mix the breeds to create a flock of your own choice, or you can have all the same breed. The choice, as always, is yours. Advice can be given on which breeds would be most suitable for your family/set up. A cat carrier or cardboard box is an ideal means of transportation. Just ensure there are ventilation holes in the box, and preferably a little bit of straw for your new girls to snuggle down into on their journey. The box can be about the size of a crisp box, but must be at least 18 inches tall. (01372) 458320, or 07963 013597. For “viewings and collections” FRIDAY, SATURDAY, SUNDAY, MONDAY and TUESDAY (9.00am to 4.30pm) ALL YEAR ROUND.